Sri Lankan opposition parties have said they will mount a legal challenge to the detention of defeated presidential candidate Gen Sarath Fonseka. Gen Fonseka was arrested on Monday, accused of working with anti-government forces and planning a coup and assassinations. He denies the charges. His wife has visited him, but his supporters say they fear for his life. Their move comes after President Mahinda Rajapaksa dissolved parliament, paving the way for early elections. Mr Rajapaksa easily defeated Gen Fonseka in elections last month, but the general rejected the outcome. In a joint statement, the opposition parties said they feared the general would be killed in detention. "We have good reason to believe that the extra-judicial arrest of Gen Fonseka may be followed up with assassination while in custody," the statement said. The opposition has also called for protests over the arrest. "We will take this matter to courts, we will take it before the people and we will take it before the international community," said opposition legislator Rauf Hakeem. Defence officials say he will probably face a military court, the BBC's Charles Haviland reports from the capital, Colombo. But another senior government official, Rajiva Wijesinha, has said he hopes any evidence will be promptly clarified and that any case brought will be a civil one. 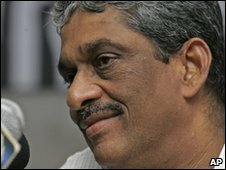 Meanwhile, Gen Fonseka's wife told the BBC she had been allowed to visit him at the navy headquarters in Colombo where he is being held. Anoma Fonseka said he trusted no one there and had therefore not eaten or drunk anything until she had taken him a meal. Parliamentary elections are expected to be held on 8 April. Mr Rajapaksa is hoping to capitalise on his comfortable victory in the presidential poll, correspondents say. He fought the January election on the back of the military defeat of the Tamil Tigers last year. Gen Fonseka also took credit for ending the long civil war. The two men fell out soon after the fighting ended and embarked on a bitter election campaign. Hours before his arrest, the general said he was prepared to give evidence in an international court on any war crime charges brought against Sri Lankan leaders.